It's been proven that flies can see 360 degrees and have several other sensors at their disposal, making them very difficult to swat. For a long time, I just rolled up a magazine and swung furiously until I eventually killed the fly, leaving a splotch of tiny guts for me to clean. Then one day I tried something—something new, something innovative. I dampened a paper towel and threw it at the fly. The paper towel hit the wall with a smack and stuck there, trapping the fly against the wall and allowing for easy disposal. I'm not sure why this technique works so well. I'm not sure why the flies can't see it coming, but they don't. Maybe it's too fast for them. Maybe it's the color of the paper towel. I'm not sure, but it get's them every time. "HOW TO WATERBOARD" IN SHOWTIME'S "SHAMELESS"
Shameless is a very dark comedy (?) on Showtime. Starring William H. Macy and Emmy Rossum, the show follows the Gallaghers, a dysfunctional south-side Chicago family. Frank Gallagher (Macy) spends his days drunk or hung over while his six children learn to take care of themselves. In episode 11 of season 5, Debbie Gallagher is researching ways to torture half-sister Sammi (don't ask) and finds this image by Tablet embedded in a fictional website. Shameless is a great show and I'm honored to have my work included. Even with the most diligent shoveling and salting, icy spots pop up on sidewalks and in parking lots. Slippery surfaces cause thousands of injuries every year, costing the injured and your company pain, lost productivity, and possible lawsuits. This poster, currently used by companies like Fuji and Scott's Miracle Grow, offers your employees helpful advice on how to stay upright and safe. Printed on cover-weight paper so it can be reused year after year, this poster should be hung at every workplace exit. Purchase yours for only $10 each or 12 for $100. The infographic "How To Walk On Ice" has now been featured on blogs such as Boing Boing, Lifehacker, io9, The Today Show, Slate, and many others. Internationally it has been featured on Huffington Post Canada, and translated into Arabic. Infographics are compact, mobile, and entertaining little blocks of information. Interesting articles may get shared, but infographics have the ability to go viral. 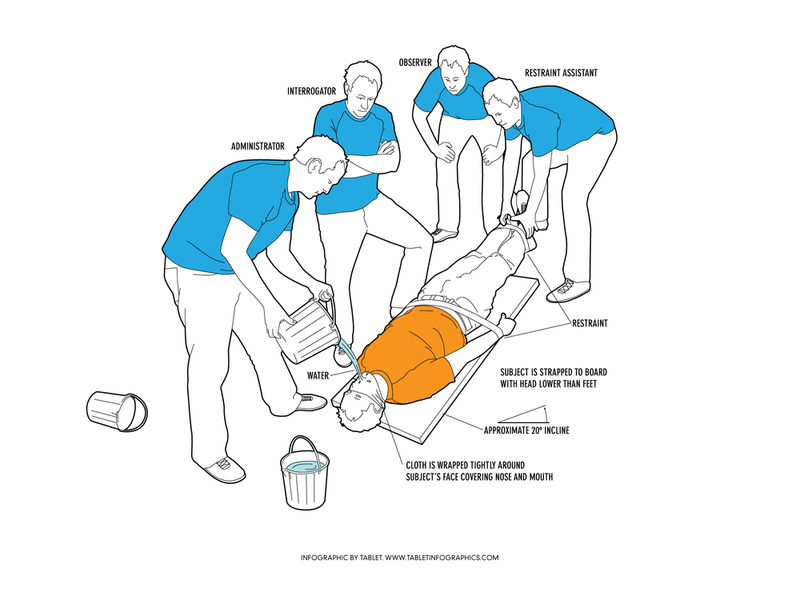 The image "How to Waterboard", first created as an artwork shown in the 2010 Wisconsin Triennial, has been included in the MOOC (Massive Open Online Course) War For The Greater Middle East. This class was taught by Andrew Bacevich, a professor of history and international relations emeritus at Boston University.